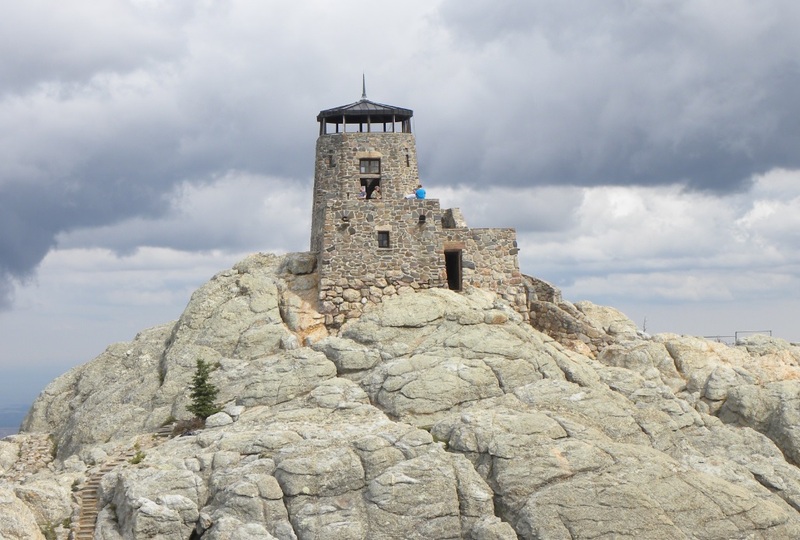 The Harney Peak Lookout Tower as viewed from the west in September 2016. - Jerry Penry photo. You are probably curious about the elevation of Black Elk Peak or looking for answers as to how it was determined. For the past 117 years, the elevation of Harney Peak (renamed Black Elk Peak in August of 2016) has been erroneously listed on numerous documents, publications, and websites as being around 7240' to 7244' above sea level. Where did this number originate, to which point is the elevation measured, and how accurate is the elevation in actuality in regard to its true elevation? This story tells the history of South Dakota's most famous peak and highest point. For historical reasons throughout the text, and with no disrespect to this peak's present name, we refer to it as "Harney Peak" for which it was first named in the 1850's. The historical data, references, and other information gathered here all refer to this peak as "Harney Peak", so to herein refer to it by its present name would be confusing in this historical context. On September 15-16, 2016, Jerry Penry, Kurt Luebke, and Paul Horsted endeavored to determine the first accurate and true elevation of this peak. They were assisted by Daryl Stisser, Jenny Stukel, Camille Riner and Anna Marie Riner. This precise survey was done to mostly satisfy curiosity, but at the same time resolve misinformation that exists as to where the elevation is actually measured to on the peak. Furthermore, the existence of a separate peak 100 yards south of the Lookout Tower has also been claimed as being the true highest point, so that issue also needed to be resolved. To distinguish this peak from the peak where the Lookout Tower resides, we have unofficially named it "McGillicuddy Peak" and will appear with that name on these pages. Our survey concluded that the highest natural rock today on Harney Peak, when rounded to the nearest foot is 7231' on the North American Vertical Datum of 1988 (NAVD88). A projected shift to take place in 2022 will place this same point at 7229' on the National Spatial Reference System (NSRS) which will be the latest vertical datum. Despite the efforts of our precise survey to determine the true elevation of Black Elk Peak, officials have refused to change the stated elevation. The 7244' elevation has no basis. It has merely been repeated and recopied for over a century. Please contact before using text or images from these webpages.